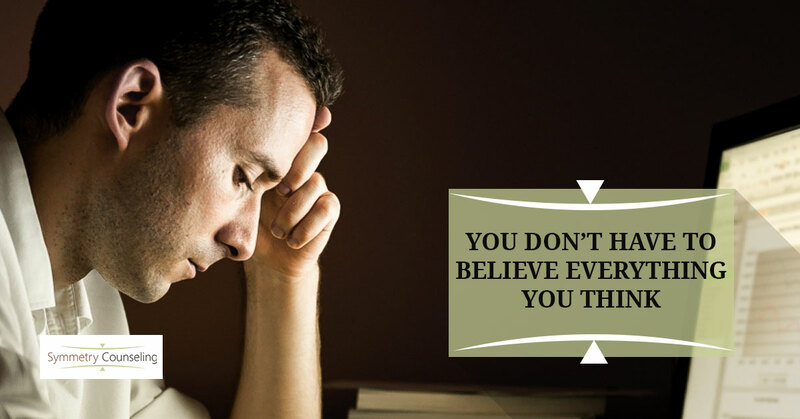 If you have ever felt consumed or overwhelmed by your thoughts, the concept that you do not have to believe everything you think can seem foreign. Without awareness of the problem, it can sometimes feel like you are a slave to your thoughts. I often hear people say that they cannot shut their minds off or that they cannot escape their thinking, which causes them a great deal of anxiety and distress. Many people feel like they have no control over their thoughts and that they actually are being controlled them. It may feel like this at times because your thoughts influence your emotions and behaviors. So, if your thoughts are causing emotions and behaviors that are distressful or anxiety-inducing, the key is in learning to change them. Not only that, but it’s imperative to not identify with them, mostly the unproductive ones, which can lead to all sorts of mental health issues like anxiety and depression, for example. You are not your thoughts, and suffering occurs when you identify with them. Believe it or not, you can choose your thoughts. You can do this by observing them using a mindfulness approach. Mindfulness is defined by Merriam-Webster Dictionary as “the practice of maintaining a nonjudgmental state of heightened or complete awareness of one’s thoughts, emotions, or experiences on a moment-to-moment basis.” While mindfulness can be achieved through a variety of physical and mental health practices such as yoga or tai chi, I am going to focus on mindfulness meditation. According to the American Psychological Association, mindfulness meditation helps to train attention and brings about an increased sense of awareness, which brings mental processes under greater voluntary control. This leads to improved mental health and can decrease struggles with things like anxiety and depression. One way to practice mindfulness meditation would be a simple practice such as present moment awareness utilizing the five senses. Begin by tuning into your five senses. Starting with sight, notice your surroundings. Look around. Next, pay attention to what you can hear in your space. Notice sounds that are both near and distant. Continue on in whatever order you choose until you have hit all five senses: what you can see, hear, taste, touch, and smell. Doing this simple exercise can help to bring you into the present and focus your attention moment by moment which will help you pull away from those overbearing thoughts. After some time of practicing present moment awareness, you can turn your attention to your thoughts. It can be helpful to close your eyes and concentrate on your breath. As you do this, you may notice that your mind starts to wander; it’s what the mind does when left to its own devices! It entertains itself. It tells stories. It makes connections. Just notice. Observe that these are just thoughts you are having and that you do not need to attach to them. They do not define you. You do not have to follow them. The purpose of mindfulness exercises is not to eradicate your thoughts, but to observe them. When you learn to become aware of them, you can examine them and, in doing so, you can decide if they are helpful or not. You can choose to hold them or let them go. If you can learn to choose productive, helpful thoughts, you can exercise control of your emotions and behaviors. Through mindfulness practices, you come to realize that you do not have to react to every thought. Being able to just notice and investigate your thoughts can help you to create a deeper sense of self-understanding and step away from the thoughts that overwhelm you and bring out anxiety. For further assistance with mindfulness practices as well as therapy for anxiety and depression, contact Symmetry Counseling.